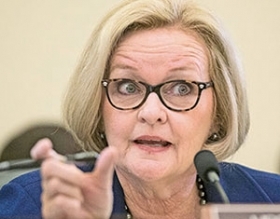 McCaskill: "When consumers and families drive a rental car off the lot, they should be able to do so with the confidence that car is safe to drive." WASHINGTON (Bloomberg) -- A Senate panel killed a proposal to permit companies to continue renting vehicles that have been recalled, a measure criticized by consumer groups, automakers and even some rental-car companies. The change resulted from an amendment by U.S. Sen. Claire McCaskill, D-Mo. It modified a bill, introduced last week by Sen. John Thune, R-S.D., that would have allowed rentals with known safety defects as long as companies disclosed the open recalls to customers. In the past week, Honda Motor Co. joined General Motors as the second automaker to back the Democrats’ push for a ban on rentals with safety defects. The American Car Rental Association, a trade group that includes Hertz Global Holdings Inc., Avis Budget Group Inc. and Enterprise Holdings, described the original Republican bill as a “significant step back in consumer protection” compared with current industry practices in a July 13 letter to committee leaders. The National Automobile Dealers Association and the Alliance of Automobile Manufacturers aired objections about the Democrats’ proposal, saying it would have the unintended effect of harming consumers because dealerships would be forced to repair rental cars before their customers’ vehicles. Thune said the overall bill would increase funding for National Highway Traffic Safety Administration investigations and double civil penalties for automakers to $70 million. Those changes would be directly tied to the agency adopting changes recommended by Transportation Department inspector general, he said. “The bill before us today makes a host of important improvements when it comes to motor vehicle safety,” Thune said. Democrats introduced an amendment that failed on a party-line vote to give NHTSA more funding and allow jail time for executives who hide auto-safety defects. Some critics said the legislation failed to reflect safety lessons learned from faulty ignition switches in GM vehicles and Takata Corp. airbags that exploded and killed motorists. The legislation approved by the panel would force the Federal Motor Carrier Safety Administration to overhaul one of its primary enforcement tools, a publicly available listing of safety violations of trucking and bus companies, which compares individual firms with industry averages. The agency would have to remove scores from public view while it responds to critiques from the Government Accountability Office and the Transportation Department’s inspector general. That change has been backed by the trucking industry. For railroads, the measure would allow the Transportation Department to adjust deadlines for implementing crash-avoiding train technology on a case-by-case basis. Thune said the action was needed because few railroads were going to make the existing 2015 deadline. Installations would be delayed to no later than 2018.